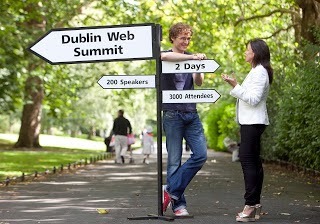 Few events, or glossy Enterprise Ireland brochures, could have sold Ireland as well as last week's Dublin Web Summit. This year's show was amazingly only the fourth installation of the event – now regarded as among Europe's leading technology conferences – but that would have been almost impossible to tell judging by the throngs of tech glitterati and power brokers dotting the floors of the RDS. The project is the brainchild of the dynamic Paddy Cosgrave, who at 27 has achieved what others can probably only dream of doing in a life-time. Cosgrave took center stage to join Prime Minister Enda Kenny on stage Wednesday to open the NASDAQ stock exchange from Ireland for the first time in history, but otherwise remained fairly well-hidden during the event, orchestrating a massive operation that involved dozens of paid workers and volunteers. The speakers' list read like a "Who's Who" of the tech and investment worlds, and was the perfect opportunity for Kenny to wax lyrical about the massive potential of Ireland's vaunted startup scene, which now stands up to comparison with other major tech clusters such as London, Silicon Valley and Israel. The fitting conclusions to the event saw Kenny discussing with billionaire tech entrepreneur Elon Musk -- one in a business suit, the other, tellingly in leather jacket and jeans -- which saw the young Musk advise Kenny that the time for third levels feels, at least in certain disciplines, had drawn to a close. "For technological companies, you need engineers," Musk said, articulating as pithily as possible the crux of Ireland's knowledge economy problem. "[So] maybe engineering could be tuition free or something like that," he proposed. Beyond the center stage, hundreds gathered to see the vast array of startup companies that had traveled from the four corners of the world just to get a glimpse of the action in Dublin. Multimillionaire investors rubbed shoulders with young startup founders barely finished their time in college, with an untold amount of investment deals (and free coffee drinking) going on everywhere. The atmosphere was electrifying. Never ones to miss a chance to plug the Emerald Isle, Bord Bía, the primary financial power behind Good Food Ireland, an industry group representing Irish food producers, wowed attendees with a vast tarpaulin-full of free, local delights, with the best of local cheeses, hams and other delicacies on offer for attendees hungry for a free lunch. For three to four days in Dublin (depending on how many pre and post Summit festivities attendees deigned to cram in to their trip), all notions of a recession or brain drain were cast out of the equation. Buoyant positivity – the inevitable follow-on from hours spent listening to inspirational speakers and tech-geeks delighted to share their next game-changing idea – was the order of the day, with a healthy dose of belief in all things Ireland and Irish thrown in there for good mix. What started as a "crazy" idea in a young techie's mind four years ago blossomed into something extraordinary. Perhaps the same process of self-belief coupled with hard work can rub off the tech industry's glittering wings on to the broader economy.